Sagwa was a Wookiee from the inland tree city of Rwookrrorro on the planet Kashyyyk. During the Imperial Era he attempted to defend his fellow Wookiees from Imperial patrols, but was imprisoned and forced to work in the spice mines of Kessel as a slave. He wore an electro-charged slaving collar and had his shaggy arms bound by heavy shackles. Years of toil took their toll on his body, leaving his brown fur balding due to illness, though he continued to selflessly spare weaker slaves from the most brutal mining duties. 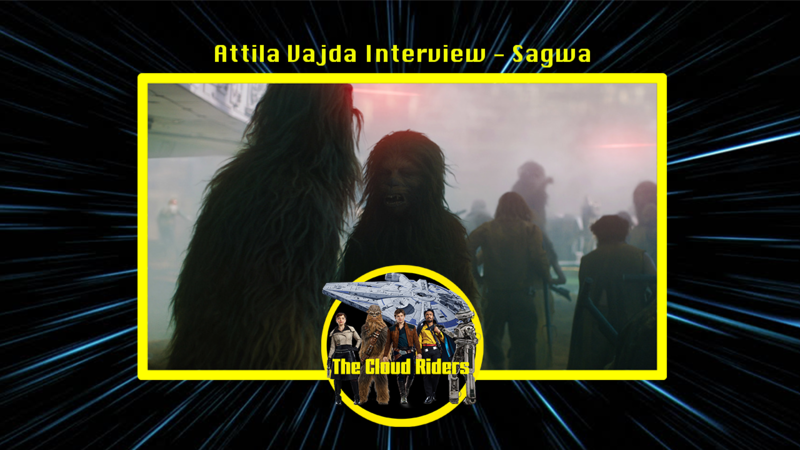 Sagwa was among the slaves who participated in the uprising instigated by L3-37, and was freed by Chewbacca after the Wookiee attacked Sagwa’s guards. The two Wookiees fought alongside each other, and Sagwa helped Chewbacca and Han Solo escape the mines with a stash of unrefined coaxium. Once outside, Sagwa fought off Pyke sentinels and helped Chewbacca load the coaxium into smuggling compartments aboard the Millennium Falcon. He bid farewell to Chewbacca before following Tak and other escaped prisoners. How did you get the role of Sagwa in Solo: A Star Wars Story? I signed up with Uni-Versal Extras and two weeks later I got invited for an audition. I had a few auditions like movement, body screening and measurements afterwards. I was auditioned by Paul Kasey, a highly skilled analyst and performer of creature behaviour. Three months later I got the call to confirm my role for Sagwa. What was the costume fitting process like? The fitting started shortly after the call. I was called in regularly for costume fitting to get the desired shape. I’m glad I had the experience of going through the process of creating a Wookiee costume. Seeing other creatures come to life was inspiring. It was fascinating to watch them build the creatures we see in Star Wars it is something to admire. How would you describe your time working on the mining planet of Kessel? It was an extremely realistic experience. So many details, many talented people gathered together, creatures around, the props, the mines, the pressure during the raid felt just like a real escape because the explosions and the wave of so many people running, fighting and screaming. I actually felt like I was on a different planet in a real war. I feel blessed to of had the opportunity to experience a Star Wars movie from both sides of the camera. I understand why Star Wars is one of the most appreciated franchises in the movie industry. What was it like filming in the Wookiee costume? At first, I didn’t know what to expect because it was my first experience in a creature costume. I relied on the fact that I have my sports background and that helped me regarding physical condition. I learned quickly that a Wookiee costume is a pretty tough one. Thanks to a great team, especially to Fiona Barnes, Natalie Hapeshis the make-up lady and Alan Murphy did a great job looking after me. You’ve made appearances at several comic conventions since the film’s release, how would you describe those experiences? Everything was new for me regarding comic conventions and I tried to connect with the fans as much as possible. I had not previously followed Star Wars so that was lot for me to learn. I’ve learned that fans are the ones who matter. They know so many details about this franchise and I respect their passion for Star Wars. I was pleased to have the chance to meet them. How was it working alongside fellow Wookiee Joonas Suotamo? First time arriving on set for shootings, I remember saying to myself,” that’s the famous Chewbacca played by Joonas” I never thought I will have this opportunity. Joonas is a great guy, he is always smiling, and he is friendly, he is Chewbacca. I didn’t have the chance to spend a lot of time with him, but he emanates a warm and approachable personality. Overall, I think he is a great guy. How does your experience in Star Wars compare to other projects you have worked on in the past? I had never worked on any movie project before. This was my first acting experience. What are some of your fondest memories from your time working on the film? To be part of such a fantastic project with such amazing people around me. I’ve made a few new friends. I enjoyed the time spent with the other three Wookiees’. It was great to be part of the famous Millennium Falcon experience. I always wished to be in movies, but I never thought I would have the opportunity of this magnitude so quickly, and on top of that to be partly directed by Ron Howard as well. For me, meeting Woody Harrelson was something special, because I used his character from “White men can’t jump” during my basketball career, as motivation while working on my jumping skills. I love this movie because of him. Overall everything was just beautiful, and I would like to thank the production for entrusting me with the role of Sagwa. It was such a wonderful experience. Has Star Wars always been a part of your life, if so, what are some of your favourite things about the franchise? I never followed Star Wars as a fan, but I always admired the creativity of the diverse worlds, creatures and characters from Star Wars movies. It was so different compared to any other movies I’ve seen. I’m proud to say that I have been involved in a Star Wars project and it is now part of my life. Do you have any favourite characters from the movies, if so, who are they and why? I remember I saw A New Hope for the first time when I was around 14, and Darth Vader was the character I liked because of his powerful voice and appearance. I also like Han Solo because of his sarcasm, but also because Harrison Ford is among my favourite actors. When you were given the role of Sagwa, were you given any info to accommodate this? Yes, I had some training with the stunt, VFX and creature teams over a period of time.